Buy Becky (coffeecocktailsandbooks) a Coffee. ko-fi.com/coffeecocktailsandbooks - Ko-fi ❤️ Where creators get paid by fans, with a 'Buy Me a Coffee' button. My name is Becky! I’m a 24-year-old bookworm and puppy mom from Minnesota. I share my bookish thoughts on YouTube and my blog. 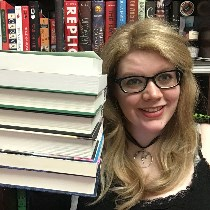 I'm also an unboxing fiend, sucker for a readathon, and uber fangirl. My favorite types of books are fantasy and mystery/thriller books, but I’m open to pretty much any genre. Feel free to find me on my other social media as well! I love to make new bookish friends. Secured Payments. Support goes to Becky (coffeecocktailsandbooks)'s account. Upgrade Becky (coffeecocktailsandbooks) to a yearly Gold Membership with a one-time payment.